Phillips: It is with saddened hearts that we announce the passing of John Thomas Phillips know to many as “Jack”. John was born September 5, 1934 at the family farm in the R.M. of Cameron, Manitoba and he was the youngest of seven children born to George Trineer and Lela Maude (Graham) Phillips. 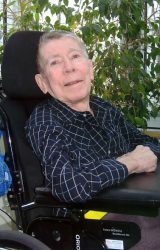 John passed away on March 9, 2015 at the Hartney Community Health Centre Hartney, Manitoba at the age of 80 years. John leaves to mourn his loving wife of 33 years Patricia “Pat”, son Patrick (Edna) Phillips and their children Madison and Jessica, daughter Alanna Phillips. Also left to grieve are Pat’s children: Brian Herman (his daughter Zoe), Gary Herman, Cheryl Kovac (her son Nick), Jim Herman and Cathy (Leonard) Lipscomb and their children Devon, Linzey and great granddaughter Olivia. John’s sister Norma (Watson) Roper, his brother Clare “Buster” (Donna) Phillips, his special cousin Keith (Joy) Phillips, sister-in-law Teresa Pidskalny as well as many nieces and nephews. John lived life to the fullest. He was a loyal and committed person in everything he did. He spent all of his professional life working for Manitoba Telephone Systems which took him to many places around Manitoba including The Pas where he would meet his wife (and her 5 children) and then off to Thompson where he would end his career. Upon retiring in 1989 he decided the call of the south was too strong and they moved “home” or as close to it as possible as he always called Lauder home. Pat continued to work and John enjoyed puttering around the yard at their first home in Hartney and of course at the “Lot” where eventually their trailer would be. He would spend many hours riding the lawn mower (even in the neighbour’s yard) and trimming trees (there definitely was a lot of those). John loved to tinker and work on projects and his vast collection of tools (sometimes 2 or 3 of the same kind) reflected this. John enjoyed travelling with his wife Pat or Patty as he called her throughout the years. Even in his failing health he was still able to take a trip to Yellowknife in the summer of 2014 to see his second oldest granddaughter graduate from high school. He was so proud of all his children and grandchildren for all their accomplishments. Family was always very important to him. John was predeceased by his son Bryan Phillips, his parents George and Lela Phillips, brother Gordon (Jigs), brother Harold (Howdie) sister-in-law Margaret (Peggy) Phillips, sister Dorothy (Dot) brother-in-law Elmer Hicks, sister Eva Irene Phillips (in childhood), brother-in-law Orest Pidskalny and mother-in-law Mary Polowy. Funeral service was held at the Faith Community Baptist Church, Souris, Manitoba on Monday, March 16, 2015 following the interment in the Lauder Cemetery, Lauder, Manitoba. Faith Community Baptist Church ~ Mission Project. Hi Patty, Sorry to hear about Uncle John’s passing. Heather and I send our condolences. Unfortunately I will not able to attend any services next week. It was nice to see you when we were in Souris two weeks ago. We are thinking of you at this time . We enjoyed the outings we had with you and John on our little excursions.